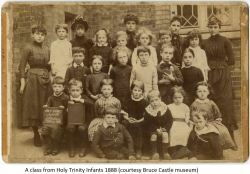 Founded in 1792 through the efforts of Priscilla Wakefield, the school was later known as the Green Coat School and it is now Holy Trinity school. The school taught reading, writing and arithmetic as well as sewing and knitting to 36 girls . 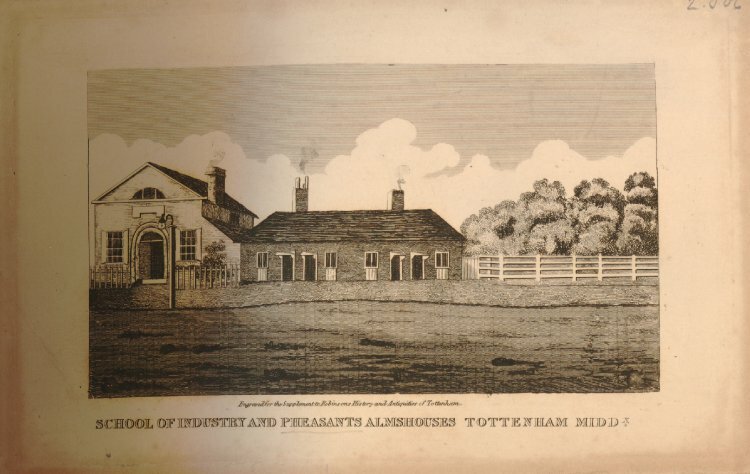 The original school occupied land given by Thomas Smith on the east side of High Road, next to Phesaunt's alms-houses at the corner of Stoneley South, and included a house for the mistress. The curriculum, the sources of income, and the management were similar to those of the Blue school, save that by 1840 funds amounted to c. £700 and the pupils attended Holy Trinity chapel rather than the parish church. There were then 40 girls, aged 8 to 14, each of whom received a guinea on leaving and triennial awards for staying in the same employment. Thomas Barber left stock worth £250 by will proved 1844 and a parliamentary grant was being paid by 1862, when a new building was erected behind the grammar school in Somerset Road. Plans to take fee-payers, who would not receive the green and white clothing, were presumably realized after the move: in 1864, 30 out of 72 pupils did not wear the uniform. Enlargements allowed numbers to rise to 173 by 1898, whereafter attendance varied little until the addition of new classrooms in 1939. The school ceased to be described as a school of industry c. 1907, when it became formally attached to Holy Trinity church. From 1952 it was housed in two buildings, the infants having moved into the old Holy Trinity school by Tottenham Green, and from 1955 it became mixed throughout, boys being admitted from the infants' department. In 1984 the Infants Schools was transferred to the council and new land given behind the Green School to allow the whole school to be on one site on Somerset Road. A History of the County of Middlesex: Volume 5, Hendon, Kingsbury, Great Stanmore, Little Stanmore, Edmonton Enfield, Monken Hadley, South Mimms, Tottenham.